As concerned Independent Moroccan journalists, we were shockingly amazed at the declaration of the procurator of the court of appeal in Rabat on September 24th, 2013, where he announced that the public prosecutor had appealed for an investigation on the editor of lakome website, on behalf of the investigating judge, for the following crimes: providing voluntary help to those who commit terrorist acts, providing tools to execute terrorist crimes, and the acclamation of terrorist acts. We consider these allegations against our colleague Ali Anouzla scandalous by all standards. It is a full-fledged crime that the Moroccan government is committing in order to put an end to the free and independent press in Morocco, creating a manipulated media. It is shameful and unprecedented to accuse a journalist who has done nothing but his job and duty of informing and presenting information. This tarnishes the reputation of Morocco. We, as journalists, consider these abstract allegations a dangerous threat to the free press in Morocco, which reminds us of the years of “lead”. As professionals, we consider these serious allegations against Ali Anouzla irrational and not based on any basis. The article in question did not include, in any form, an expression or implication that the website or its editor have provided any support to those behind the publication of the video, which was released by the “al Qaeda in the Islamic Maghreb” organization. We also wonder how can a media means, purely used for its informative objective, how can it be a tool for carrying out a terrorist crime?! We need to mention that neither Ali Anouzla, nor any other Moroccan journalist, has solicited terrorism before. We refer here to Anouzla’s previous anti terrorism articles. The prosecution of a journalist under the law of terrorism is a shame for the Moroccan government, dissolving thus all the promises it gave in regards to freedom of press and expression. While journalists were striving for prosecution according to the publishing and press law instead of criminal law, they are now facing terrorism judge!! This is a serious detour, indicating that we are taking backward steps. Additionally, we strongly resent the heinous position of the ministry of communications through its announcement that actually preceded the procurator’s proclamation, convicting the journalist before justice says its final word. The announcement claimed that the substance of the case is not the freedom of expression, but the incitement of terrorism and its publication. We consider this statement a direct involvement in the case. It is also an obvious manipulation, challenging the claimed independence of justice, trying to give legitimacy to any possible verdicts against Anouzla. We were also surprised by the confusion that characterized the ministry of communication clarifications regarding the 2009 Vienna declaration on terrorism, media and the law, presenting however misleading information. The declaration which was ironically used to justify the ministry’s procedures, clearly guarantees freedom in the media coverage of terrorism. Vienna conference also acknowledges the right of the public in obtaining information about terrorist acts or terrorist attempts, and media should not be punished because they presented that information. We also condemn the shameful silence of the national press syndicate and its bias through its statement earlier, where it condemned the journalist and sided with the public prosecutor’s office, reminding the syndicate of its responsibilities as history will document its failure in defending the journalists, one of its main objectives. Instead, it overlooked the fact that the journalist is being prosecuted under the law of terrorism, choosing to settle accounts at a personal level with the journalist. We consider the allegations against Our colleague unreal and serious, and his prosecution is dangerous and a reason for concerns about the future of the freedom of press, of expression, and the human rights in Morocco. We are worried about the fate of our colleague Ali Anouzla,who is prosecuted according to the law do terrorism, and we totally refuse all these allegations against him, which make a journalist who publishes news, a terrorist. An unprecedented occurrence, that didn’t even happen during the years of “lead”. We consider Anouzla’s prosecution under the so called “law of terrorism ” a scandal that requires our efforts as journalists to stop this as it is dangerous and will affect the future of journalism in our country. We denounce the heinous and serious campaign against journalist Anouzla, lead by political motivations and some “pay per view” journalists. We renew our appeal for the immediate release of our colleague Ali Anouzla, and we warn from turning his case into a political one, promoting a fake patriotism as some political parties statements have claimed. We call all journalists to participate in a sit-in organized by the national committee for Anouzla’s support, in front of the Parliament building Thursday, September 26th at 6:00 p.m. We also call them to join all forms of protests demanding the release of our colleague Ali Anouzla. We hold the Moroccan government accountable for the physical and psychological safety of our colleague Ali Anouzla. (Reuters) – Rebel fighters including foreign Islamists took control of a military post on Syria’s southern border with Jordan on Saturday after four days of heavy fighting with President Bashar al-Assad’s forces, activists said. The former customs post on the edge of the city of Deraa, where Syria’s uprising against Assad erupted in 2011, was seized by several groups including the al Qaeda-affiliated Nusra Front and the Islamist Ahrar al-Sham, according to the reports. A video from the site showed a masked fighter claiming victory in the name of the two movements, and a captured tank from which a black Islamist flag was fluttering. Rebels also seized a fuel depot north of Damascus, the Syrian Observatory for Human Right said, while state media said Assad’s forces made gains in rebel areas of east Damascus. The fighting across Syria highlights the relentless nature of its civil war, as battles with conventional weapons rage on regardless of steps to destroy Syria’s chemical arms – the result of a rare outbreak of international consensus on Syria. An August 21 sarin gas attack, which prompted global condemnation and led the United States and Russia to bridge some of their deep divisions over the Syrian conflict, killed hundreds of people in rebel-held areas of the capital. But similar numbers die every week in air strikes and artillery fire by Assad’s forces and by guns, rockets, mortars and tanks deployed by both sides. The British-based Observatory, an anti-Assad group which monitors violence through security and medical sources inside Syria, said 170 people were killed on Friday, including soldiers, rebels and civilians. Authorities restrict media operations in Syria, making it difficult to confirm reports from activists or official sources. Syria’s state news agency SANA said the army made major advances in the eastern Damascus districts of Jobar, Qaboun and Zamalka, where they found a network of rebel tunnels, used by the rebels to store weapons. It quoted a local army commander saying one of the rebel tunnels was 150 meters long. In some of the tunnels the army found armor-piercing explosives weighing 30-40 kg, as well as French-made anti-tank rocket launchers and parts of anti-aircraft guns, the report said. The three eastern districts where the army reported making advances are on the edge of the Ghouta district which was hit by chemical weapons last month. United Nations inspectors said in a report two weeks ago that sarin was used in the attack. Western powers said the report showed Assad’s forces were responsible for the attack, an accusation which the president and his Russian allies have denied, pointing the blame at rebels. The inspectors returned to Syria on Tuesday to continue investigations into allegations of chemical and biological weapons use, including three previously unreported cases around Damascus in the days following the Aug 21 attack. A car carrying members of the team was seen leaving their Damascus hotel on Saturday morning but there was no indication of where they were heading. They are due to complete their work in Syria on Monday and present a full report by late October. The day after that team completes its mission, experts from the international watchdog the Organisation for the Prohibition of Chemical Weapons (OPCW) will begin inspecting Syria’s stockpile of chemical weapons, under the terms of a deal struck this month which averted U.S. military action. OCCUPIED JERUSALEM, (PIC)– Captive Dr. Ahmed Qatamesh, aged 61, sustained bruises after falling from an Israeli army jeep during his transfer from Raymond prison, south of 1948 occupied Palestine, to Ofer jail. Ahrar Center for prisoners’ studies and human rights called on human rights and international organizations to exert pressure on the Israeli occupation authorities to implement what has been agreed upon and provide special vehicles for transferring the patient prisoners. For his part, Director of the Center Fouad Khuffash said that the Israeli prison administration had earlier signed an agreement with the captive movement during the Karama hunger strike, which requires providing a special vehicle to transfer the patient captives, but the prison administration did not comply with the agreement. The Palestinian academic and writer Ahmed Qatamesh from the city of Ramallah has been held in administrative detention since April 2011. He had been arrested twice earlier by the Israeli authorities, and had served 6 years in administrative detention. JERUSALEM (Ma’an) — Israeli forces on Saturday handed notices to several residents in the al-Sadiyya neighborhood in Jerusalem’s Old City, giving Israeli forces permission to access the rooftops of their houses, locals said. Local resident Inas Ali Mitab told Ma’an that Israeli forces entered several homes and handed homeowners the notices, threatening to arrest anyone who refused to grant them permission to use their rooftops. Residents refused the orders and tore them up on the spot, Inas added. Jerusalem’s Old City is located inside East Jerusalem, a part of the internationally recognized Palestinian territories. It has been under Israeli occupation since 1967, and Israel unilaterally annexed East Jerusalem in 1980. Approximately 200,000 Israeli settlers reside in the area in contravention of international law. The Quartet announced its new plan Thursday. JERUSALEM (AFP) — The Middle East Quartet published a plan Thursday to revive the ailing Palestinian economy, in an effort to support peace negotiations between Israel and the Palestinians. The report came as Israel announced it would ease restrictions on the impoverished Gaza Strip and West Bank, and after international financial institutions urged Israel to loosen sanctions against the Palestinian territories. “Without economic empowerment, any negotiations are likely to seem too remote from reality to be credible,” said the Quartet (the European Union, Russia, United Nations and United States) and represented by former British premier Tony Blair. The three-year “Palestinian Economic Initiative” would focus on private sector growth. It identified eight key sectors targeted for development, including construction and building materials, agriculture, energy and water, and tourism. On Wednesday, Israel officially announced it was easing some restrictions on the Palestinian territories. International Relations Minister Yuval Steinitz said Israel would extend the operating hours of the Allenby Bridge, a border checkpoint near the West Bank town of Jericho and the only point of access to Jordan for Palestinian residents and businesses. He was speaking after ministers from the Middle East Ad Hoc Liaison Committee met on the sidelines of the UN General Assembly to discuss progress in the talks so far. Israel recently approved the allocation of 5,000 work permits for Palestinians from the West Bank, and last week agreed to allow new building materials into the blockaded Gaza Strip. The moves came as the International Monetary Fund and World Bank called for an easing of Israeli restrictions, saying the Palestinian economy was unsustainable under the current conditions. “The restrictions imposed by the government of Israel continue to be the most significant impediment to economic growth,” the World Bank said in a report released ahead of Wednesday’s AHLC meeting. The Quartet’s plans would include building “10,000 to 16,000 housing units every year in Gaza, as part of the overall range of 25,000-40,000 housing units in the West Bank and Gaza. They would be priced at $35,000-$50,000, it said. UN chief Ban Ki-moon called on all donors Wednesday to step up efforts to help the slowing Palestinian economy. “The situation is volatile and the status quo is not sustainable. In the long term it is damaging to both the Israelis and the Palestinians,” he said. International institutions and the Palestinians themselves have stressed that, even with continued donations, the economy will not grow. They have emphasized the importance of private sector development, which requires Israel to ease restrictions. Syria – a new Islamic Union or an informal alliance ? On September 24 it seemed like a new major Islamic coalition was announced on all kind of social media. The leader of Liwa at-Tawhid appeared in a video, speaking for eleven other groups, declared they denounced the Syrian Military Council and stated the insurgency in Syria was to be based on Islamic Law. About the coalition and assumed government. 1. The said groups invite all military and civil groups to unify within a clear Islamic frame created on an Islamic power based upon Sharia arbitration and make it the sole source of legislation. 2. These groups consider that, only those who suffered and sacrified on ground hold, have the right to represent their faithful sons. 3. These groups consider that, any outside formations, without reviewing the public opinion, can not represent them and have their recognition. Hence, the coalition and the assumed government headed by Ahmad Tu’ma do not represent them and do not have their recognition . 4. These groups and factions invite all military and civil groups to unify their word, to reject discrimination , and to prioritize the Umma’s favor over the common favor. The statement itself can be regarded as strong condemnation of the Syrian Nationcal Council and it’s military branch the SMC. Weird enough some of the groups signing the statement are part of the SMC. In the graph below you can see how the groups are alligned. Another observation to be noted is that ISIS, the Islamic State in Iraq and as-Sham, is not included in the coalition. This led to all kinds of speculation about the alliance between Jabhat an-Nusra and ISIS. Soon enough the picture below appeared, clearly stating that Jabhat an-Nusra and ISIS are “hand in hand” as it says. Some people reacted extatic, especially supporters of the Islamic Caliphate in Syria saw this statement as the formal creation of new nation-wide Islamic coalition, the next step on to declaring an Islamic Caliphate in Syria. Especially the text by Michael Weiss suffered from opposition from all directions; whilst he basically was wondering whether the alliance would hold since it was a weird mix up from ultra Islamists like Jabhat an-Nusra and for example Suqur as-Sham, often described as an opportunistic band of thugs and smugglers. Then, on Friday September 27, the official Twitter-account of Jabhat an-Nusra renounced there even was a formal coalition in the following seven tweets. ‏‏‫#جبهة_النصرة‬‏: لم يكن بيان “رفض الإئتلاف ومشروع الحكومة المؤقتة” سوى مجرد رفض للائتلاف ومشروع الحكومة المؤقتة ولم يكن تحالفاً. ‏وإنّ هذا الرفض هو مسلمات عقيدة ومنهج ‏‫#جبهة_النصرة‬‏ “أعزها الله”، ولم تُراجع القيادة العامة بذلك، حيث قام أحد الإخوة الأفاضل بالتوقيع عليه. ‏ننوه: أن أي حلف أو اتفاق يعقد على مستوى الجماعة مع أي فصيل جهادي في الساحة يصدر عن مؤسسة المنارة البيضاء عبر قنواتها الرسمية. ‏كما نحذر أيضاً من محاولة بعض الأطراف في الساحة استثمار الخلاف الدائر بيننا وبين إخواننا في جماعة “الدولة الإسلامية”. ‏وتدخلات إيران وحزب اللات وجرائم النظام النصيري، وأن نعطي هذه التحديات الأولوية في الصراع. Gaza, ALRAY – Hundreds of youth rallied Friday in northern Gaza Strip in support of Al-Aqsa Mosque, heading to the Nahal Oz border crossing. The march was called for earlier by Youth for Intifada Coalition. Israeli soldiers intensified their presence along the border fence and fired tear gas bombs and live bullets to disperse the demonstrators who continued to gather near the border area. An Israeli army spokeswoman said that “approximately 300 Palestinians” entered a zone near the fence within the Gaza Strip deemed off-limits to Palestinians by Israeli forces. “In order to disperse the gathering…soldiers used tear gas,” she told AFP. 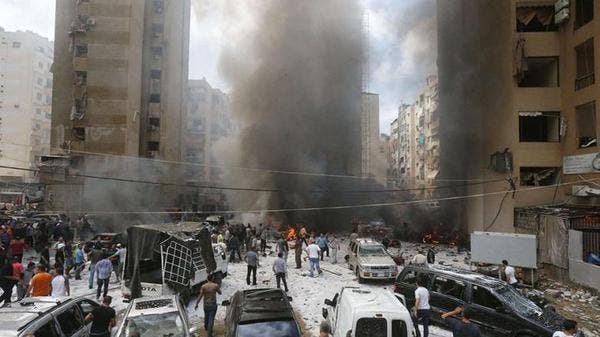 Firefighters and residents gather at the site of an explosion in Beirut’s southern suburb neighborhood of Bir al-Abed on 9 July 2013. The Lebanese army on Saturday tried to break up clashes that killed two militants of the powerful Shiite Hezbollah movement in a firefight with members of a Sunni clan in eastern Lebanon. “Members of the al-Shiah (Sunni Muslim) family opened fire at a Hezbollah checkpoint in the center of Baalbek, provoking militants to return fire,” a security official told Agence France-Presse. Initially, two Hezbollah were members killed, and five others wounded, but the death toll increased, reaching to four later. According to the Associated Press, Hezbollah set up checkpoints in its strongholds after an Aug. 15 blast in Beirut’s southern suburbs that killed 27 people. Many resent the checkpoints. Baalbek lies in the eastern Bekaa Valley close to the border with Syria, across which Lebanese Shiite Hezbollah guerrillas and Sunni Muslim fighters have travelled to join opposing forces in the Syrian civil war. It’s simply unbelievable to watch Israel continue to get away with these crimes against humanity without a collective world clampdown. Of course – many world citizens already know why Israel continues to get a way with murder … literally. That reason is simple; the United States vetoes any attempt at the United Nations to hold Israel accountable for their war crimes and violations of international law. What we need is a “coalition of the willing” to force Israel’s hand … a coalition that will force Israel to go back to 1967 borders with threat of force. Israel has shown it’s not an honest broker in the peace process and the world needs to stand together to stamp out Israel’s fascist tendencies. It’s hard to imagine a good outcome when the government’s ideology is based on blood purity and eugenics. The oppression that the Palestinian people have to live through on a daily basis is simply mind blowing. It has existed for decades and it is a systematic, intentional gameplan to forcibly cleanse Palestinians off their lands. And it’s been working like a charm. But whatever – go watch Dancing With the Stars. We’ve shared numerous examples of this kind of oppression on our Facebook page and this website. For example – we shared that Palestinian children can be imprisoned by the Israeli military for up to 6 months without charge or access to their parents (source); it is illegal for Israel to do this to Jewish children however. I could point to the Oxfam report that says Israel is responsible for “two decades of obstruction and broken promises” (source). The available evidence to further prove my point is nearly endless approaching infinity. And now a new report by the Defence for Children International Palestine points out a horribly frightening fact. Israel is the only nation in the world that prosecutes children in military courts (but not if they’re Jewish). Not Iran, not Russia, Saudi Arabia, Iran, Syria or any other potential future country that Israel may look to attack in the future … just Israel. Repeated military offensives on Gaza and a draconian six-year-old blockade have led to persistent allegations of collective punishment of the civilian population, a violation of international humanitarian law. Since the outbreak of the second intifada in 2000, Israeli forces are responsible for the death of more than 1,000 children in the Occupied Palestinian Territory, according to evidence collected by Defense for Children International Palestine. And as we shared HERE – Israel has been responsible for the torture of Palestinian children when in custody. Some have even died. And there is this recent situation where the Israeli military arrested a 5 year old for “throwing a rock”that hit a tire of an Israeli settler. It’s systematic oppression. Here’s a piece of disgusting news, so disgusting in fact that it beggars belief. Israel and its army of occupation are not just brutal, inhuman and utterly devoid of morality. They also have no self-respect, as the snippet below, posted on the Facebook page of Cadfa, the Camden Abu Dis Friendship Association, on 26 September shows. 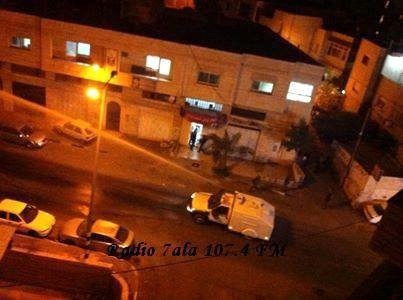 Last night [25 September] a new weapon by the Israeli army against the people in Abu Dis: they drove round the main streets and sprayed sewage water everywhere – descriptions are of the really disgusting smell absolutely everywhere. It entered the houses and the kids’ rooms – and it didn’t clear like teargas apparently does. It hung around in the fabric inside houses and made everyone fear for their health: rumours of possible viruses are going around. The Israeli army have been using a lot of tear gas recently in Abu Dis. The children in the Abu Dis schools have lost many of the first school days in Abu Dis, as the army have been shooting tear gas into school playgrounds as well as around the nearby university. We [Cadfa] are writing to our MP, asking him to ask the Foreign Office to enquire about this, in order to protect the people (and in particular the children) in the face of such attacks. You may want to do the same. Does anyone have contact with news media that might cover this particularly the sewage spraying? We know it is not the first time in Palestine – have heard of it in Nabi Saleh and Bil’in when there have been demonstrations, and then last Friday [20 September] in Aizariah next to Abu Dis. But this is the first time in our “twin” town, right in the middle of all the families, and it must not be allowed to become routine (anywhere)! The Israelis have chosen to stoop to levels hitherto unexplored by humanity. It is up to us to make sure that the innocent do not suffer as the “chosen ones” continue their downward journey to hell.